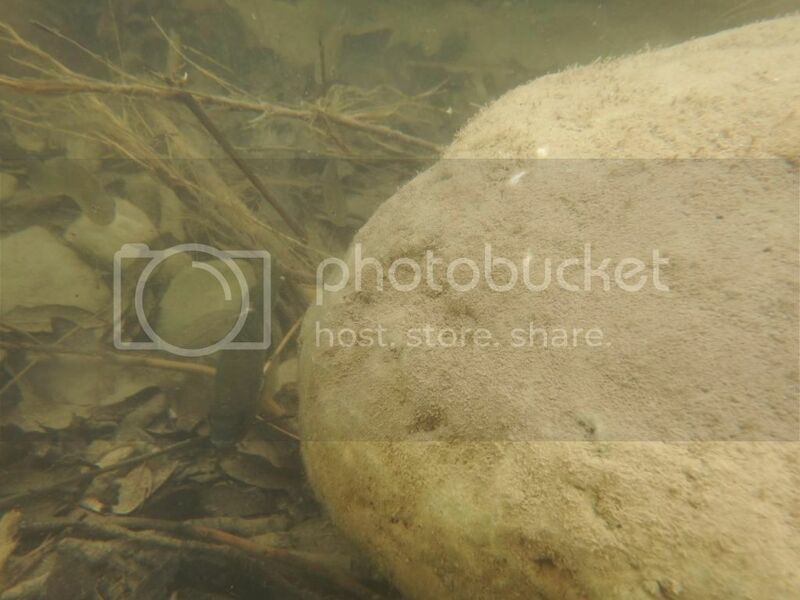 These were taken last year, in a section of river that's had some issues. I was curious what kinds of sunfish we had, so I decided to go fishing. I cooked some table shrimp and brought it with me as bait- figured the smell would get their attention. I mostly had about five zillion shiners come darting up and nibble all my bait off, and I was afraid to yank it away because I've seen a couple of foulhooked shiners slowly die thanks to gill damage. 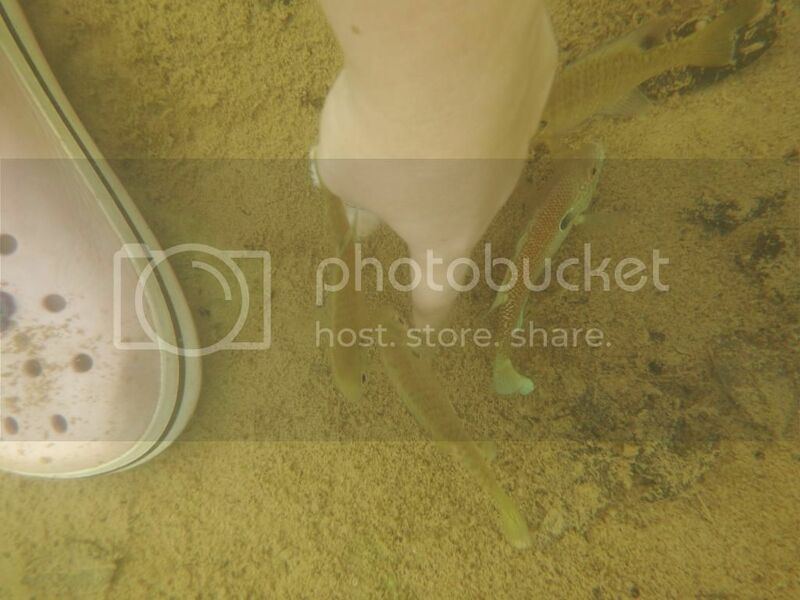 So after a while, I'm standing in two feet of water, trying and failing to get the attention of some sunfish, and there's about two dozen shiners swimming around my legs. 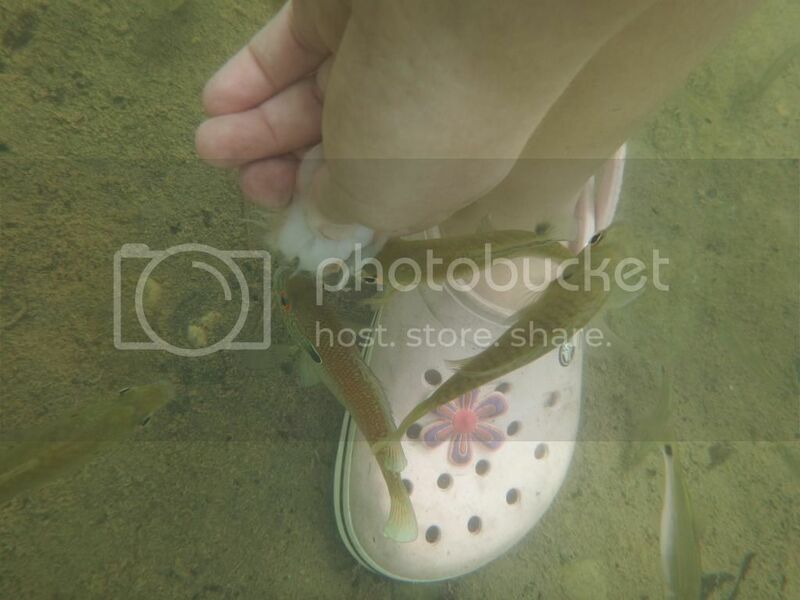 I still had plenty of bait, so I just stuck my hand down in the water with some bait, and in about two minutes half the shiners were nibbling on the bait. Next thing I know, a sunfish is kinda just sidling up. A few sunfish hung around the edges for a minute, then one darted in and got a bite. I kinda gave up on catching them at that point, and I decided to just photograph them. This was way more fun, for me and for the fish. About ten minutes later, about eight sunfish were taking turns grabbing food, the shiners were still around, and a baby trout was eyeing me. Trout never came over- too shy, I guess. I know there's an orangespot or two in there, and I'm pretty sure there are some greens. Any ideas what the others are? Also, which are the female orangespots? You'll have to excuse the weird angles, this is me bent over with my waterproof camera. Those are my feet and the camera is not upside down, so I was kinda doing standing-up yoga in an effort to get good pictures of these guys. That one beauty of a male orangespot kept turning up. Honestly, I wanted to keep him. I didn't know if he'd eat my glowlight tetras, though, and I didn't know if he was legal to keep. I left him alone. Not sure if that's the same orangespot or not, I think it might be an even prettier one. This was me trying to pet them with the food hand. They didn't seem to mind so long as I let them get the food. Are the two in front of my hand female orangespots? They look like it, but I'm not certain. Fairly sure the big one to the right is a green. Is this a territorial thing for sunnies, or could they have been playing tug-o-war with a bit of food? Biggest orangespot I've ever seen in that river. Not shy in the slightest. There we go, decent photo of some not-male-orangespot ones. Also the best photo I have of the shiners. Well- a non-blurry photo of 5/6 of one. Is the little shiner under him a small one of those (blackspots, I think they're called, or blacktails) or something else? Any clue what this guy is? I only saw this one, off in a separate area. I think the one directly behind it in the second picture (not the shiners, the one behind that, the one with the odd head) might be a younger one? These live in a pool that's mostly separated off but is fed by streams and never dries up. I've seen fish jump to the rest of the river if they want, it's just really shallow around that area. Caught my attention because it's a lot darker than the others I've seen. It didn't look stressed or like it had a reason to be unusually dark... could it be some form of a hybrid? Is the one right in front of it here the same type? Bluegill, bluegill, bluegill, longear, bluegill, longear, bluegill, bluegill, bluegill, bluegill, bluegill, bluegill, bluegill, bluegill, longear, longear, bluegill, bluegill, bluegill, longear, bluegill, bluegill, bluegill, bluegill. Yep. Bluegill and dollar or longear. I am not able to tell a dollar from a longear with these photos.Thinking dollar. That is what I see. You also have some shiners in there, but they are beyond me with the photos. Trout? Is this springfed water, that is very cool? Does the state stock them? Many of the pix are not clear enough to ID, but I agree with UncleWillie and Matt most of them do appear to be bluegill and longear (or maybe dollar if you're in the easternmost 1/4 of TX). I dont see any that look like orangespotted. Yes their color can lighten or darken according to mood, social status, etc. The trout were definitely stocked. There aren't many, because everybody hears about the stocking, and then everybody catches them all out instead of letting them breed. Only the small ones and the smartest ones make it at all. I believe the shiners are blacktail shiners. I'd actually considered some for my aquarium at one point, but they're crazy hyper... they'd probably need at least a 6' tank. If I ever set up a native fish tank, I'm gonna get a big one so I can keep shiners. The 'orangespotted' ID came from a little pamphlet with pictures of various fish, so I'm quite possibly wrong. I'm in Georgetown, slightly north of Austin. I don't think the sunfish are stocked, just the trout. It looks like we probably don't have dollars around here. I think I can catch a bunch later and get some better photos... I'd like to get them IDed, if they aren't orangespots. 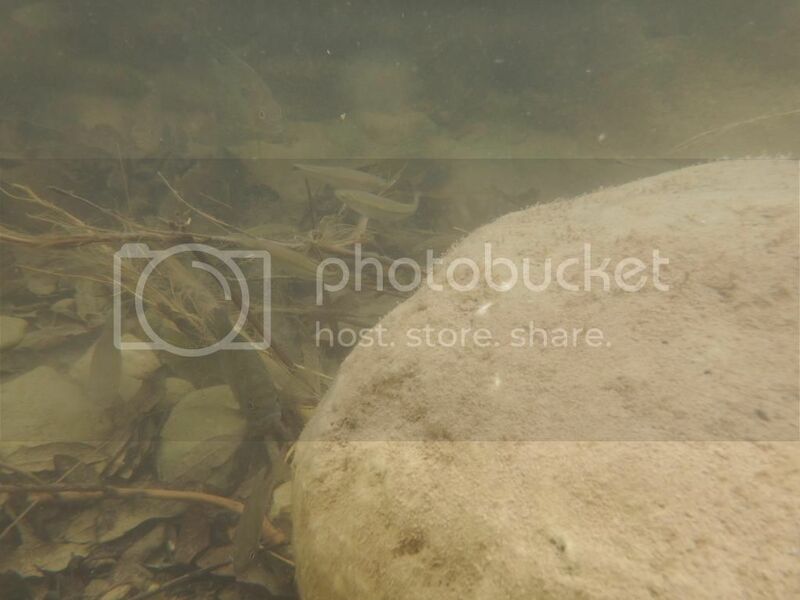 I think I have some photos of similar fish I found about half a mile downriver, and those are good photos, I'd caught the fish in question. I'll go look for them. Edited by Betta132, 29 January 2015 - 05:27 PM. Irate Mormon will be unhappy, no greens? Search for photo tanks. That is how people get streamside ID quality photos. Some that you will find are Pro. quality. But a critter tank will work, as long as you get the fish above the curves in the bottom of the tank. Very hard to do with darters, and madtoms. Most people use a squeeze paddle to gently push them to the front of the tank as they snap pics. Nothing in your photos looked like O-spots to me. I am however not one of our better ID guys. I have a little clear box that's about 3/4" wide and 4" tall, and pretty much watertight. I intend to use it for darters and baby sunnies on my next critter-investigation trip (Not 'till March, February is cold). I have a critter tank for holding and inspection. The problem here is I was having fun and didn't want to scare them by trying to grab them. With sunfish, would it work to just gently capture the fish in one hand and hold it on its side in the water? I've done that a couple of times to inspect things, but I'm not quite sure if it's bad for the slime coat. 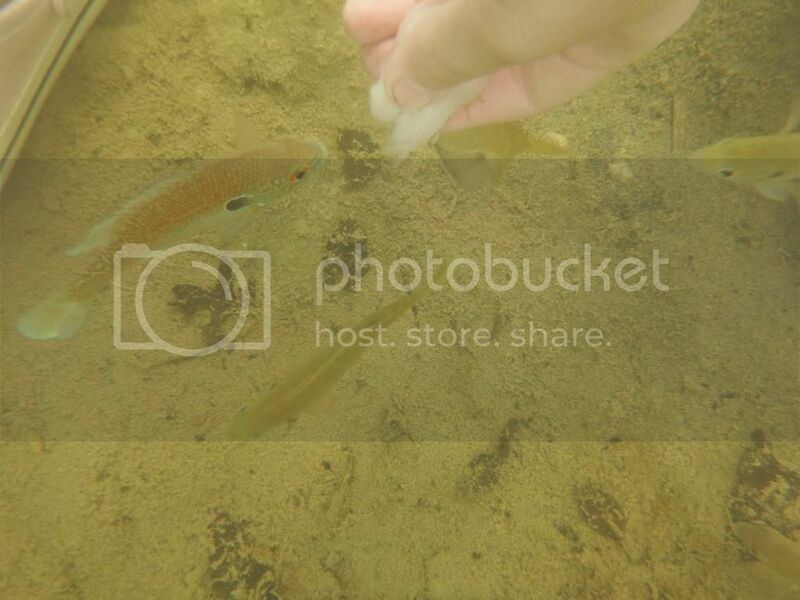 I'm not grabbing and squeezing the fish, I just use a wet hand to kind of cradle it so that it's about 3/4" underwater, two fingers near the head so it can't wriggle forwards, not pressing on the gills so it can breathe. I let things go as soon as possible. I know they're poky on top, but I can avoid that fairly well. My main concern is not holding the fish out of water, because that seems purely terrifying for the poor thing. So less than a minute later, the fish is back in the river, only having been out of water for less than 5 seconds of that. They all dart away, hide for a few minutes, and then go back to life just fine. I just need to wear sunscreen and I can do that all afternoon. 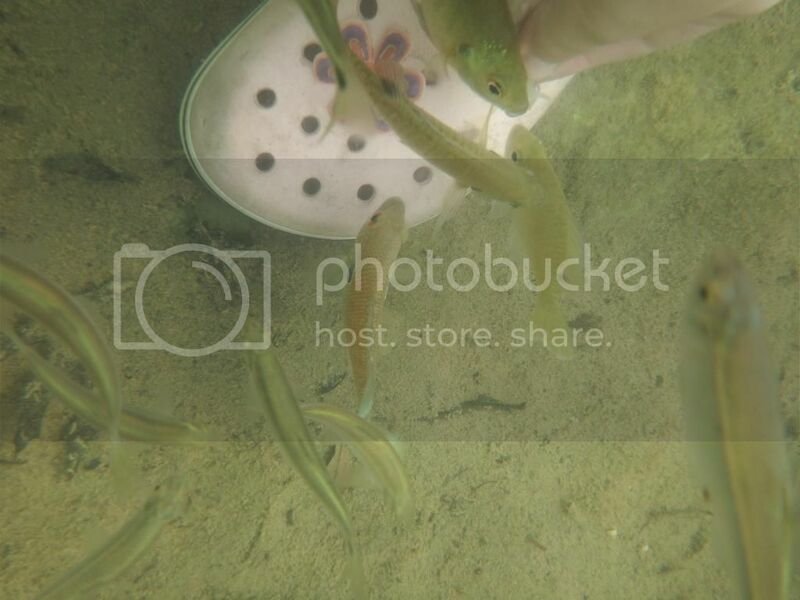 Everyone else can talk about the sunfish, but the last picture and the last one with your shoe in it clearly show Cyprinella venusta (backtail shiner) to me. You are right, they are very large and very active for a shiner, but you could keep a few in a 55 with some other smaller shiners or chubs (I have done this with fiery blacks and they are about as big and active). I just googled a lot of variations of 'silver fish with black spot on tail in Texas' until I found a result, nice to have a confirmation. Thanks! Everybody just calls them bait thieves- they're small enough to nibble all your bait away without getting hooked. Really irritating. They'd be cool to keep, and I do have a 65g, but I'm going to keep little calm fish and I think shiners might frighten them. Otherwise, to be perfectly honest, I'd be trying to figure out how to catch myself about half a dozen little streaks of silver lightning. I'll second Michael on the Blacktail Shiners. Also I agree with everyone else there are a lot of bluegill in your photos and a few longears which are probably what you thought were orangespotted sunfish. They look like longears I have seen in photos from TX before I do not think they are dollar sunfish.